Traditional medicine seems to be taking root at the Wits Medical School. Traditional medicine is an intrinsic part of South African society, has still not found official recognition in mainstream medicine teaching. The Wits Medical School though has started laying the foundations of this integration through the installation of a garden of indigenous plants that are used for healing. 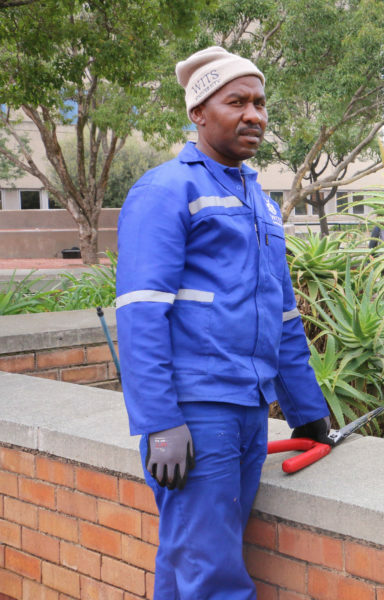 It is not clear when the garden was first planted but Sonnyboy Nkosi (41), a gardener at the Wits Medical School, told Wits Vuvuzela that he has used a number of the plants in the garden for medicinal purposes. “When my sister’s arm was swollen, we boiled umaYime leaf, being the leaf of the bush lily and rubbed it against the swollen area. She was completely healed in less than a week,” he said. Nkosi highlighted that the use of these traditional medications can be either through ingestion, inhalation or bathing. “When my body aches, I boil inkomfe (star flower) and use the water to soak my body. Also, inhalation of the water vapour produced when I boil the wild garlic always helps when I have flu,” said Nkosi. The plants in the garden include the bush lily which is used to treat fever and snake bites, star flower which heals muscular pain and stomach disorders, and the bitter aloe whose roots and leaves are mainly used as a laxative, but can also be used for arthritis, hypertension and stress. Fourth-year medical student, Nkosinathi Mazibuko, said he once suffered from pneumonia and did not get any better even when he took conventional medicine. “I was in a small village in Limpopo when I was told to see a traditional healer. For seven consecutive days I would phalaza (drink large amounts of water and vomit for detoxing the gut) and futha (steam) while drinking various kinds of muthi (medicine). I was completely healed after that,” Nkosi said. Dr Tendai Ponde, a medicine graduate from the University of Cape Town, told Wits Vuvuzela that although the conventional route is prescribing western medicine, the effects brought by traditional medication should not be overlooked. “A lot of western medicine comes from indigenous populations which essentially used traditional medication. The only difference between the two is that those who prescribe traditional medicine hardly keep concrete evidence or data like the practice of western medicine does,” said Dr Ponde. Although the Wits Medical School hosts the traditional herb garden for medicinal purposes, the formal teaching of the use of traditional medication has not yet been incorporated into the curriculum but some students strongly believe that it should be. Change does seem to be underway as traditional medicine is a small part of the curriculum of students studying pharmacy. “When students in the pharmacy and pharmacology department go into their fourth year of study, they are required by the council to have a research component in their curriculum where they choose which area in traditional medicine they would like to delve into,” said Professor Sandy van Vuuren. Currently, 12 fourth-year students in the department are conducting research on pharmaceutical medicine and “out of the 12 students, 10 are focusing on traditional medicine against infections in the urinary tract”, according to Professor Van Vuuren. “Other subjects they focus on are using traditional medicine to treat inflammation and skin, [eliminate] probiotic bacteria, purify blood, treat blood sugar conditions and lastly the use of South Africa’s indigenous oils for smelly feet,” Professor Van Vuuren told Wits Vuvuzela. Hlambani Shirinda, an MSc Medicine student, is currently doing research on traditional medicine. She said, “My focus is to test the South African medicinal plants against the anaerobic organism of the gut. “This field is particularly important to me because my father is actually a traditional healer,” Shirinda said. Wits Vuvuzela: Alternative medicine as the next step towards transformation, March 19, 2017. Wits Vuvuzela: Reproductive healthcare beyond the reach of many women, March 2013, 2018. Wits Vuvuzela: HEALTH FOCUS: Help is on hand for pregnant Wits students, April 18, 2018.